I hope you have enjoyed the trial of my football selections. The football season is now coming to completion across Europe and as the middle of May is approaching and I have completed seven weeks of the trial I have decided to end the trial. I feel they have been a success and the trial has achieved what I aimed for when I started. The results have shown that the profits are consistent and steady with no big losing days that cause stressful situations and that over the long-term the profits will allow a small betting bank to be compounded to provide a very useful additional income each month. The graph below is a good indication of how the results have performed over the trial. 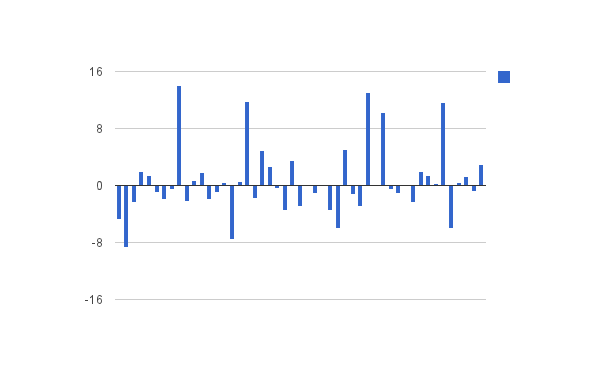 After the poor start, where the first three days were losers and the bank stood at -15.83 points it has been a steady and profitable recovery. This is typical of the performance I have seen since I started using bookmaker’s accounts at the end of January to place my bets. My bank now stands at 220.39 points using a starting bank of 100 points in less than four months. 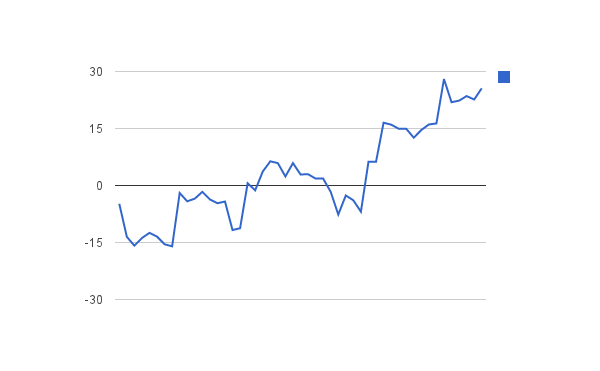 As I have mentioned before I aim for 20 points profit each month, we missed this target in April mainly due to the bad run at the beginning of the trial but still made a profit of 16.92 points, my poorest full month yet. May is on target to make the 20 points as the bank for May stands at 10.64 points with more than half the month left. A profit of 20 points each month would double the bank after five months and this doesn’t account for months were the profit is greater than 20 points. I have yet to have a losing month since monitoring these selections since October 2011. If you had followed the trial with a £1000 bank and £10 a selection then your bank would now stand at £1258.80, if you used a bank of £2500 and £25 a selection then your bank would now stand at £3139.50. This is using a 100 point bank. However, I feel that the selections are consistent enough to allow the use of an 80 point bank; obviously this would improve the return on the initial bank further. This is a great return when you account for the fact that the lowest your bank would fall to during the trial would have been 83.99 on a 100 point bank. This is typical of the risk to reward ratio I have observed since using the selections from January. The selections are so consistent due to the fact that the average odds during the trial was 3.26, this means there are no long losing runs that you have to battle through to return to profit. Most of the selections are low odds, below 4.00, but it is the odd selection above 4.00 that helps give profitable days, as when some of these are winners they have a dramatic effect on the day’s results. The second graph shown below is a summary of the winning and losing days. It is very clear that the winning days and the losing days are fairly equal but the winning days give a better return than the losing days take from the bank. This is what makes the selections profitable. I have decided to run the selections as a subscription service. The overriding reason for doing this and not selling a pdf as a system is that I cannot control where that information goes after it has been sold. This would affect my ability to earn a profit through my selections if the method became widespread and affected the prices available. Deciding what to charge and what type of subscriptions to offer has led to me think that a basic monthly subscription is best but also offering the change to subscribe for a year with a heavy discount is also beneficial to people willing to commit for the long-term. Remember the long-term view is exactly what I am looking for in subscribers. We are never going to have 30 point winning days but we are never going to have 30 point losing days either and I think it important for people to bear this in mind when deciding whether to subscribe. As the football season is winding down for all of the European leagues and we are entering a period of International games then Euro 2012, I have decided to extend the first month’s subscription to 31st July 2012 and anyone interesting in subscribing for a full year will get a year subscription that runs until 31st July 2013. The cost will be £45 for one month’s subscription but a heavily discounted £275 for a full year. If you think this is for you and you want to join me taking a steady stream of money from the bookies follow the link below and I look forward to having you onboard.